In 2018, a Very Merrytime Cruises take place on most voyages aboard all Disney Cruise Line ships from mid-November through right before Christmas. In addition to the usual activities and fun expected from a Disney cruise, there are many magical holiday extras in keeping with the holiday spirits. Sailings range in length from three to seven nights with itineraries to the Caribbean and Bahamas, including stops on Castaway Cay, Disney's private island. 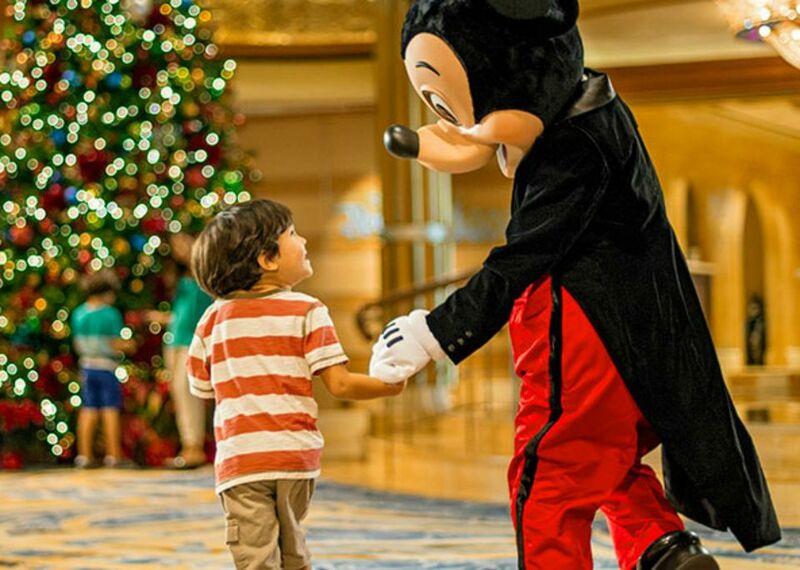 There are four ships that host a Very Merrytime cruise during the holiday season. The Disney Magic sails four- to seven-night Bahamian and Caribbean cruises departing November 10, 2018, to December 23, 2018. The Disney Wonder sails seven-night Bahamian and Caribbean cruises departing November 2, 2018, to December 21, 2018. The Disney Dream sails three-and four-night Bahamian cruises departing November 9, 2018, to December 24, 2018. The Disney Fantasy sails seven-night Eastern Caribbean cruises departing November 10, 2018, to December 22, 2018. Mickey’s Tree-Lighting Magic takes place on the first night of the cruise in the atrium lobby where Disney characters lead holiday carols and the lighting of the glittering, three-deck-tall tree. The Winter Wonderland Ball celebrates the arrival of Santa and Mrs. Claus, offering an opportunity to don holiday attire and join Disney friends and princesses for a glamorous ball. A variety of family holiday activities include building gingerbread houses and meet-and-greets with Santa Claus and favorite Disney characters. Youth holiday craft sessions are held to teach the kids how to decorate stockings and gingerbread men cookies, make holiday cards, and create holiday animation cells. Storytime with Mrs. Claus gathers the children in the atrium to hear well-known Christmas stories from her rocking chair by the tree. Holiday storytellers will share tales of Christmas, Hanukkah, and Kwanzaa, plus a story about the magical feeling of the holidays on a ship. At the Deck the Deck Holiday Party, Disney friends lead games such as hula hooping and limbo under oversized candy canes, along with dances for the whole family like the “Yuletide Slide” and a conga line around the pool. The Disney Cruise Line’s farewell on the final night of each cruise, Til We Meet Again, features a special holiday edition with Disney characters and the ship’s crew in a musical finale led by Mickey Mouse. Families sailing during the holiday season are treated to ships decked out from stem to stern with traditional “turkey day” fanfare, Christmas festivities and snow flurries. Decorations onboard the Disney ships include 124 Christmas trees; 4,473 yards of garland; 14,000 yards of ribbon; over 5.5 miles of Christmas lights; and one giant candy cane for a tropical deck party. While Santa shares 300 pounds of gingerbread cookies, the life-size gingerbread house takes 320 hours to make with 650 pounds of gingerbread, 5,250 gingerbread bricks, and 220 pounds of sugar icing. When the ships stop at Disney’s private island in the Bahamas, Castaway Cay, the celebration continues with a decked-out Christmas tree, Disney character meet-and-greets, and holiday island music. Plus, the island's tram is decorated to resemble a reindeer, complete with antlers and a tail. On Thanksgiving cruises, families can feast on a Thanksgiving Day dinner and more. Guest will receive visits from Mickey Mouse and Minnie Mouse dressed in traditional Thanksgiving attire, and a special turkey towel animal in their stateroom upon turndown. Also during the special Thanksgiving voyages, big NFL football games are broadcast live on the ships’ outdoor, jumbo LED screen located near the family pool.